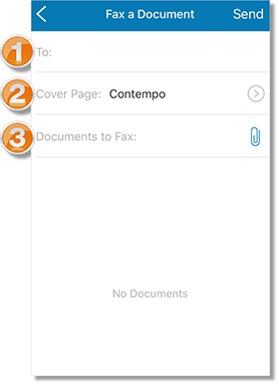 How do I send fax messages from the Office@Hand mobile app? You can send and attach a fax document using the Office@Hand Mobile App. This article will guide you in faxing a document using your Office@Hand Mobile App. Tap the New Message button, then select New Fax. You have the option to add a cover page to your fax. Note: The file size limit of your attachment is 20 MB. IMPORTANT: If this is the first time you are attaching a document from Box or Dropbox through the Office@Hand Mobile App, you must Allow Office@Hand to access your cloud storage. The integration of Office@Hand Mobile App with your cloud storage is needed so you can browse to the source location of the document to be attached. On the Cover page screen, you may select your cover page template. You may also type your note to add to cover page (optional). Your cover page will be previewed while you make your changes. Click Save to complete your changes. Note: The sender information (From) on your cover page can be edited from your AT&T Office@Hand online account. 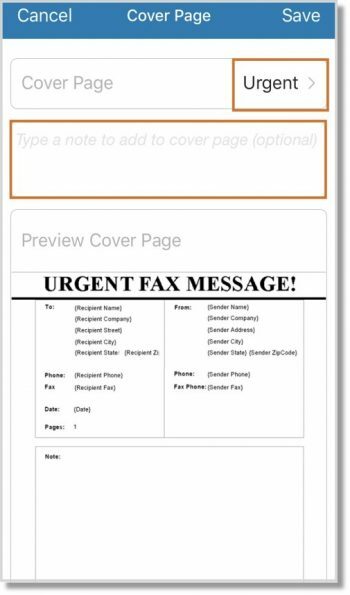 Tap Send when you are ready to send your Fax message.